Beginning in January, the city court clerk's office will begin installing boots on cars belonging to people with three or more outstanding parking tickets. After booting, if tickets and the $75 booting fee aren't paid in full within 48 hours, the car will be towed to the city impound lot. The new Boot and Tow Program is expected to be approved by the Memphis City Council on third reading at its next meeting on Tuesday, December 6th. Tickets are considered outstanding after 60 days. If violators wish to avoid having their vehicle booted, they'll have the month of December to work out a payment plan with the court clerk's office. Once a vehicle has been booted or towed, payment plans will no longer be offered. If a car is towed, the booting fee is dropped, but tickets and impound lot storage fees must be paid in full before the car can be retrieved. A person with more than $500 in unpaid parking tickets will be towed without booting. "The city court clerk's responsibility is to collect money owed to the City of Memphis for parking violations," said city court clerk Thomas Long. "It is not the objective of the city court clerk's office to boot or tow vehicles, but we will do what we must do." Delinquent parking fines will also begin increasing after the first of the year. Tickets not paid after 60 days will increase from $20 to $40, and after 30 more days, they will increase from $40 to $80. These changes are a way to recoup some of the nearly $1.5 to $2 million lost annually in unpaid parking fines, Long said. There's a one-year statute of limitations on unpaid parking tickets, and Long said many people simply don't pay, hoping they won't get caught for a year. Others circumvent paying tickets by making false claims about stolen tags, but Long said they're working on a solution to that problem. 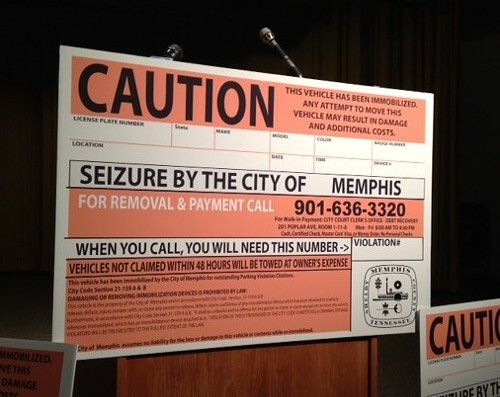 The Memphis Police Department will use its license plate reading cameras to seek out those with three or more delinquent parking tickets, and special event officers will apply the boots. If boots are removed or damaged by the car's owner, criminal charges may be filed.